I decided instead of boring you with my thoughts on every meal I cook during the week, I would post my favorite meal of the week. To be honest, I just dread admitting how I changed our menu plan and which meals were just ok. So there. Please feel free to leave a comment if you really enjoyed this weekly post and I will continue it. I imagine it will not be missed. This week's winner is the Garlic Soba Noodles. Yummy. Besides tasting good, it was easy. I also served it to the whole family. No meat substitutions for my husband. Luckily, he likes tofu. I did set aside some noodles for the kids before I jazzed them up with Chard, Garlic, and Onions. The kids are not crazy about the soba noodles, but I really like them. I enjoy reading your menu plan...but I know how you feel. Great picture- what a cutie pie! 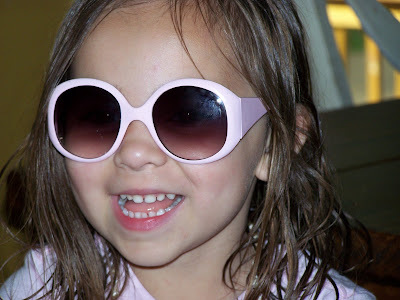 The sunglasses remind me of Johnny Dep's as Willy Wonka...too funny and way stylish!! !